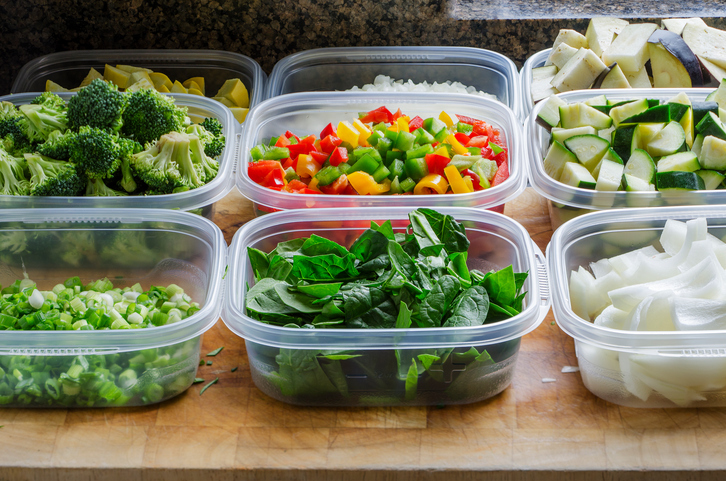 Meal prep is a great way to save money on food each week, and to make sure you’re eating a healthy and balanced diet which contains all of the nutrients you need. Check out these great ingredient ideas from the vegan supplement experts at Vitabiotics which are handy to have at home to help you to plan your meals ahead. Peanut butter is a great source of protein, and it is low in sugar if you opt for more natural brands. Add a spoonful to your overnight oats or chia pudding, or simply dip sliced banana or apple into it for a nutritious snack. If you’re feeling fancy, why not stuff a date with peanut butter and dip in dark chooclate for a healthier sweet treat that is also a great source of energy. Nuts are a great source of healthy fats, and are an incredibly versatile ingredient to include in your meal prep. Roast almonds with a little maple syrup and cinnamon for a sweet and satisfying crunch, or drizzle chilli and garlic powder onto cashews with a little olive oil before roasting if you’re looking for a savoury snack. 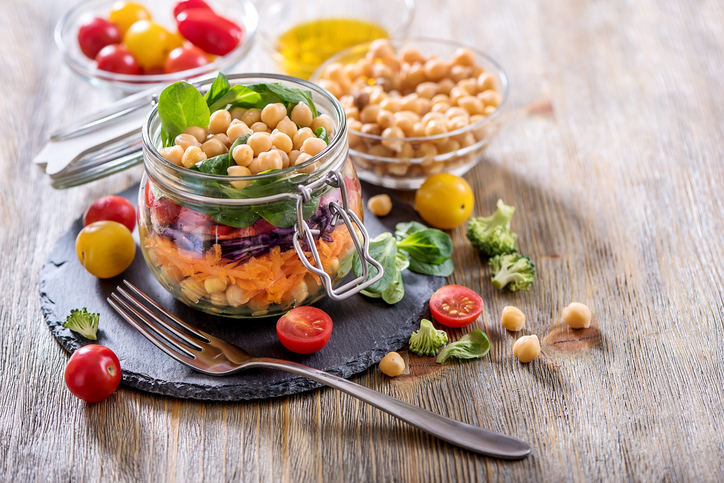 Pulses such as lentils and chickpeas are a great addition to any vegan diet, providing lots of fibre and protein to help keep you feeling full. Tins keep for many months in the cupboard, or opt for dried pulses you can cook yourself for an even longer shelf life. Add to sauces and stews, eat on their own with pasta salads, or use them to make falafel and ‘meatballs’. The uses of pulses are endless. We like to roast up a batch of chickpeas to throw over salads and lunches for an extra boost of protein. Grains, specifically whole grains, are the perfect food to add to a varied vegan diet. By simply stocking up your pantry with healthy whole grains, you can make healthier choices with ease and not miss out on these filling foods. Opt for oats for breakfast and couscous for lunch to introduce healthy grains into your vegan diet. Sticky and sweet dates are a great afternoon treat if you’re hankering for something sweet. You can eat them on their own, or dip them in your favourite nut butter for an extra boost of protein. Dates keep well when popped in the fridge, so make a great meal-prep item to include on your menu. Quinoa is not just a trendy ingredient. As it is low in calories, and high in protein, quinoa is a nutritional powerhouse too. Use quinoa in place of rice or pasta in your meals to help keep you satisfied for longer, or use to bulk up pancakes or porridge in the mornings. Apple cider vinegar is an absolute kitchen staple. This vinegar is made by fermenting the juice of apples, and its zing adds flavour and depth to a whole range of dishes. Try mixing a splash with some extra virgin olive oil and herbs for a fresh and easy dressing, or use as a marinade for tofu chunks when mixed with soy sauce, chili sauce and a little vegan sweetener. delicious, flavoursome dishes using ingredients you already have at home. 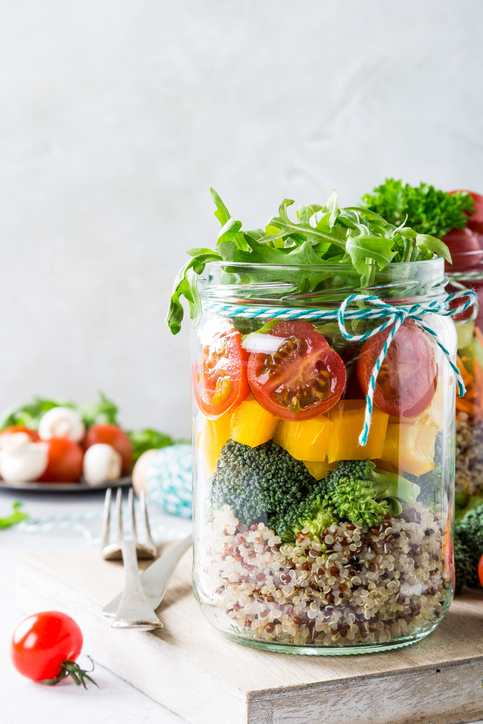 It’s essential to get at least 5 portions of fruit and veggies in your diet each day, so when meal-prepping make sure you have a selection of veggies to hand to add to your dishes. We like preparing a batch of cucumber, red pepper, carrot and broccoli which can be left in the fridge for a few days and can easily be added to your meals. A side of leafy greens is also a great way to help pulses and carbohydrates break down and be easily absorbed by the body, so don’t skip your greens! Textured vegetable protein is a great, cheap addition to your meal prep. TVP soaks up flavour easily, so add to sauce based dishes such as spaghetti bolognese to add texture and bulk. As it’s dried, it keeps for a long time in your cupboard, making it particularly cost-effective. Tofu is often unfairly thought of as being bland and tasteless, but it’s an easy way to boost the protein in your dishes leaving you feeling fuller for longer. Carbohydrates provide most of the energy needed in our daily lives, both for normal body functions (such as heartbeat, breathing, digestion and brain activity) and for exercise (like cycling, walking, running up the stairs and all types of resistance training). Complex carbohydrates take longer to digest and are full of fibre, vitamins and minerals, and so make a great addition to your meal prep dishes. 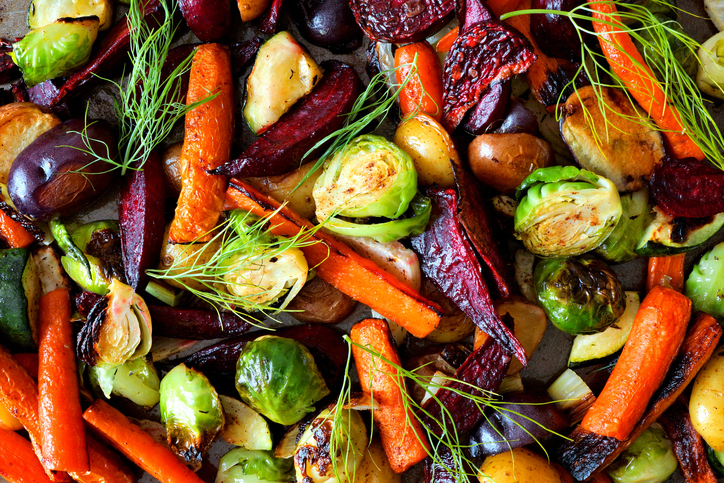 Roast up some sweet potato and throw it on top of some whole grains with a side of veggies for a delicious and nutritious lunch.